The best camera is the one you have with you – that’s just the way it is. There’s no point in crying after the professional DSLR you left at home, when you’re looking at the perfect Kodak-moment” and you need to take a picture quickly before it’s gone. 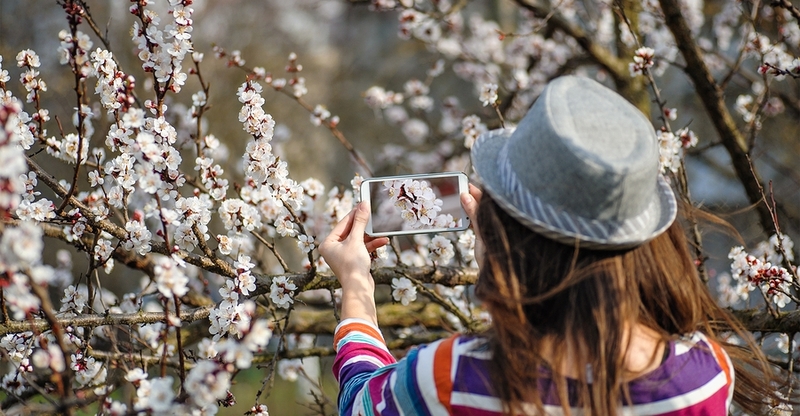 It’s true that smartphone cameras don’t have all the features that DSLR’s have, but with these tips you’ll be able to capture images that will amaze everyone when you tell them you “only” used your phone. My extra tip for you: always remember to wipe the camera lens clean before you start snapping away! Negative space … it looks good. Real good. “Negative space” simply means the area around and between the subjects of an image. When it comes to composing great photos, use simplicity to your advantage. When you include a lot of empty space, your subject will stand out more and evoke a stronger reaction from your viewer. Oftentimes, negative space is a large expanse of open sky, water, an empty field, or a large wall, as in the examples below. A leading line is any line in a photo that draws the viewer’s eye into the picture, from one part of the photo to another. Think staircases, building facades, train tracks, roads, even a path through the woods. They’re great for creating a sense of depth in an image, and they can make your photo look very well designed. Repetitive patterns are another pleasing subject to photograph. They appear whenever strong graphic elements are repeated over and over again, such as lines, geometric shapes, forms, and colors. These patterns can make a strong visual impact. Sometimes, simply photographing a beautiful, tiled floor can be enough to create a striking image. Other times, it’s more fun to keep an eye out for where they appear naturally. If you’re taking a photo from a distance, you may be tempted to zoom in. Actually, it’s better not to zoom in. Instead, either get closer to your subject or take the photo from the default distance away, and crop it later on. That way, you won’t compromise quality and you can play around with a larger image later on. Let’s face it: You’d be hard-pressed to find a great smartphone photo that was taken with a flash. Most of the time, they’re overexposed and make the colors in your photo go totally out of whack. Even the iPhone 6’s TrueTone duel LED flash isn’t perfect. Instead of using flash, take advantage of the sources of natural light you can find. You might even play with shadows, like in the second image below, or create a silhouette. Once you’ve taken the photo, play with the “Exposure” tool in your favorite photo editing app to see if you can make the image slightly brighter without getting too grainy. While posed photos can be great for memory’s sake, candid shots of people doing things, or people with people, are often far more interesting. Why? Because they more effectively capture the emotion and essence of the moment. One of the best ways to capture an interesting candid shot is to take a lot of photos. You’ll have more to choose from, and often the best photos happen when the stars align in a single moment — everyone’s eyes are open, one person is tilting their head just so, you finally got a shot of Derek smiling with his teeth, etc. Use the right photo editing apps. Composing and taking your smartphone photo is just the first step to making it visually compelling. Editing your photos using the mobile editing apps is the next step — and a very critical one, at that. There are a lot of great photo and video editing apps out there for mobile devices. If you’re interested in a video full of awesome smartphone camera hacks, check out this article! Read the full article with even more tips over at HubSpot.